Recently, I wrote an article primarily focusing on using free-hand scrapers. In this article I’ll talk about the other main scraper category, Scraper Planes, where the scraper rides in a plane body. In the Scraper Plane category, there are multiple types, but the commonality rests with most excelling at retaining a flat surface. The free-handed style scrapers require more focus and skill to obtain similar results. In this article I’ll focus on two specific scraper planes. 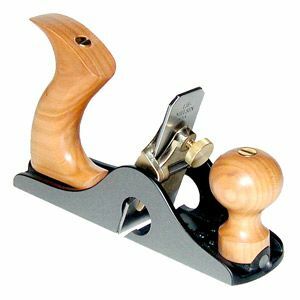 The first scraper plane is the model 212-Iron scraping plane, which is based on the Stanley No. 212. This is a small format scraper plane, and the Lie-Nielsen version has a plane body made of ductile cast iron. The blade is 1/8” thick A2 steel, which is thicker than the original Stanley irons, and helps minimize chatter. The iron’s adjuster, on this plane, allows the user to change the angle at which the iron sits in the plane, and dial in the sweet spot. I set my iron so it leans forward (away from the wooden handle) approximately 15 degrees, which seems to be the optimum angle. If the wood I’m working doesn’t cut well with the normal setting, I’ll carefully take the iron out of the body. I always remove the iron through the sole of the plane, to reduce chances of dinging the sharp iron. By holding the iron as if it were a card scraper, I can quickly find the angle where the wood cuts best. There are three options I’ve used to transfer the new angle to the plane. While holding the iron at the new angle, I can either: move the plane body up beside the iron and adjust the frog so it matches this angle; grab my protractor, so I know the angle that works with this wood; or instead, put a piece of light colored scrap wood against the edge of the iron, and draw a line I can again reference when I replace the iron in the body. To replace the iron in the body, I always come up through the sole of the plane body, again working towards saving my sharp edge. I choose the No. 212 when I’m working small flat pieces, like one might expect in boxes, picture frames or even small tables. There is nothing to prevent one from using the No. 212 on a larger flat surface, like a large table, but it would just take more passes with the smaller width of this iron. There is something about this sized scraper plane that just feels good in the hand, much like reaching for that favorite block plane. 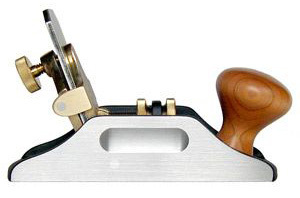 The other scraper plane is the model 85, which again is based on an original Stanley model; The No. 85 Cabinet Maker’s Scraper. This plane body is also made of ductile cast iron, which strengthens the body, and will likely save the tool from the accidental fall to the floor. The iron again is 1/8” thick A2 steel, but it is shaped somewhat like an upside down “T”. There are some unique features in the No. 85. First, this plane has a full width iron, so it can work against an adjacent vertical surface. Another unique feature, which dovetails with the first, is the handle adjustability. Both the front and rear handles can rotate (after loosening) either left or right, to help prevent the user’s knuckles from contacting adjacent wood. The No. 85 does not have the angle adjuster for the iron, and with the iron’s angle hardwired, can be a bit easier to set up. The irons on both of these scraper planes are quite a bit easier for most beginners to sharpen, at least compared with the hand-held scrapers. This is due to almost identical techniques as are used to sharpen a regular hand plane’s iron, and a light camber is also an option on both. As a matter of fact, the primary difference between the scraper iron and the hand plane iron is the angle of the bevel. Most scraper planes have a primary bevel angle of 45 degrees, and as I do when sharpening my bench plane irons, I use an additional 5 degree micro bevel, to expedite the sharpening process. In order to allow the honing guide the ability to reach these higher angles, it is important to modify a section of its body. A quick suggestion, when working a bevel with this high of an angle, is to only use pull strokes on the water stones. You might get away with a light push stroke, if you already have great skills and a light touch, but I find it’s not worth the chance of digging into the stone. User beware! I prepare the back of the iron exactly the same as when I prepare a hand plane iron, using David Charlesworth’s ruler trick to hone out at the very tip of the iron, rather than spending unnecessary time honing a large section of the back. I hone both the bevel and back of the iron to 8000 grit. I get questions from someone at almost every training session, as to why I’m not turning a burr on the scraper’s iron. I find the scraper planes are aggressive enough as is, without the addition of a burr, but this is ultimately up to the end user. Besides that, the lack of what I tend to describe as an inconsistent burr reduces any tweaking needed between sharpenings, to again find the sweet spot. To set the shaving thickness, I place the plane body on a known flat wooden surface, which for many may be your workbench. I loosen the thumb screw, disengaging the iron. While holding the plane body flat on the bench top, I apply light to firm pressure to the midpoint of the iron’s back, and while holding this pressure, re-tighten the thumb screw. Similar to the method used when setting the iron in a bench plane, I test the iron’s setting on scrap wood, prior to using the scraper plane on my project wood. If the iron needs some tweaking, laterally or deeper, I tap the iron very lightly with a small hammer. This usually works easier if I just slightly reduce the pressure on the thumb screw. Once I find my setting, I’ll again snug up the thumb screw. As a reference, I am usually looking for a very wispy shaving from my scraper planes. If I’m working (or fighting) some difficult wood, I find most will give up their best surfaces when stressed the least. Take a closer look at the Lie Nielsen #85 Cabinetmaker’s Scraper and the Small Cast Ductile Iron Scraping Plane. To see Highland Woodworking’s entire selection of Lie Nielsen hand tools, click here. I tend to favor the old reliable hand tools that I’ve always used This new tool does look as though they have put a considerable amount of work into the design work of the model. I love keeping older tools going, as I have quite a few in my shop. If you get the chance, stop by one of the Lie-Nielsen events and see how these newer versions compare. I think you will nicely surprised. The Wood Slicer: A Great Bandsaw Blade Take a Look at the May Wood News Online Magazine!